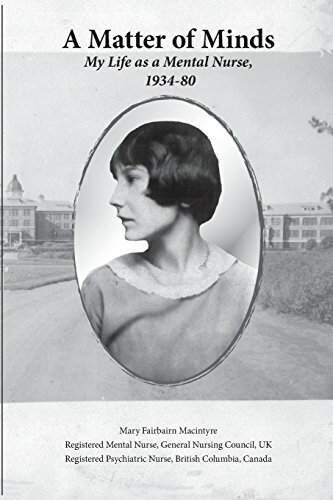 “A Matter of Minds” by Mary Fairbairn MacIntyre is an amazing combination of historical information and the journey of the author’s mother as a mental health nurse in the United Kingdom and Canada, from 1934-1980. The book begins with a great overview of how mental health nursing, care, treatment, and diagnosis came about. Initially patients were placed under observation for a variety of reasons, from “mischievous habits,” sexual addiction, and domestic issues, to sudden loss of cows and over excitement. Early “mad houses” or “asylums” came under the belief that the “insane” were conferred by God as a punishment for wickedness. There were no proven successful treatments, so everything was trial and error, along with some sadistic treatment. In addition, those who cared for and treated these individuals had little or no training, and medicines like today were not available. Lobotomies, restraints, and beatings were often the treatments of choice. Interestingly enough, individuals were observed for either 3 days or 14 days, depending on the problems they caused for the overseers. During early times and for decades to follow, it was believed that only male attendants could care for individuals with these concerns, as females weren’t believed to have the capacity to be disciplined and organized. After several years in training and finally receiving certification as a Staff Nurse, the author’s mother worked in various inpatient mental institutes. She describes various encounters her mother had with patients, some that had been institutionalized for years, who were exhibitionists, violent or catatonic, or just wouldn’t follow rules. After serving in this capacity for several years and dealing with a wide variety of mental health professionals and patients, she went to work as a private nurse to the rich and famous. Given all the money they had, the wealthy still experienced outbursts, medical issues, paranoia, and lastly death. The author will say that given her mother’s passion and compassion, she did very well with her patients, sometimes acting in defiance of the doctor’s orders. The author gave an excellent brief overview of the mental health system throughout the years to the time of her mother’s passing. It was just enough information to give a historical background, but not overwhelming. The writing style of the author was easy flowing, very interesting and often very descriptive of barbaric treatment. Her description of the “class” system of staff was also quite interesting, along with the rules and guidelines for single male and female staff. In addition, it was noted that single women could not become pregnant or they were immediately dismissed. During those early years, male attendants took care of male patients and women took care of women. “A Matter of Minds” by Mary Fairbairn MacIntyre is very well written, and an easy read. Readers will see the author did her research, much of which came from her mother or her mother’s journals, and provided just enough information on the evolvement of the mental health system. A very enjoyable read that I give five stars!